At their meeting on January 17, members of the Princeton Planning Board gave final approval to a 17-unit housing development to be built on the Princeton Ridge off Province Line Road. The ‘Province Line Woods’ application is the latest and final phase of construction of homes in this part of northwestern Princeton. The lot is bounded by Province Line Road to the west, Cherry Valley Road at the north, and the Leonard Court and Frederick Court subdivisions off Drakes Corner Road to the south. Each house will sit on a lot of approximately 1.5 acres. A very large area of forested land will be permanently preserved as a result of approval of the plan. A cul-de-sac development featuring 17 large single-family homes is not likely to set the pulse racing among those of us who care for walkable urbansim, but this development has several good features. First, it uses the municipal ‘cluster zoning’ ordinance, which means that instead of covering the entire site with houses, the developer will focus construction in just one corner. The rest of the site, approximately 115 acres in total, will be permanently set aside as open space. The open space tract includes an access easement allowing addition of a walking trail in future, which would run through the woods to Cherry Valley Road. The development will also include a cycle path connecting it to Frederick Court. Originally, vehicular access to the new homes was to have been via Frederick Court, but a large group of residents from Frederick Court and Drakes Corner Road objected. The developer then introduced the current plan to the Planning Board at a hearing on October 4, 2018. The new plan involves improving an existing access road through wetlands, which will connect to Province Line Road. This access road would intersect with Province Line Road around the existing intersection with Stout Road. The New Jersey Department of Environmental Protection had to give special permission to allow this new road, and it was opposed by nearby residents and environmentalists, including representatives from the Watershed Institution. On more than one occasion, members of the Planning Board opined that they wished that the whole development application “would just go away”. The revised site plan as shown above features a bike path through to Frederick Court instead of a road for cars, but neighbors also objected to the concept of a bike path. In particular, one local resident testified that she thought a bike path might pose a security risk to a water tower on the property. The Planning Board ultimately decided to accept the plan with the bike path, citing municipal code relating to site accessibility. The developer also committed to minimize site disturbance during construction of the homes, and to use porous pavement for driveways. The full Planning Board hearing can be seen at the video below. 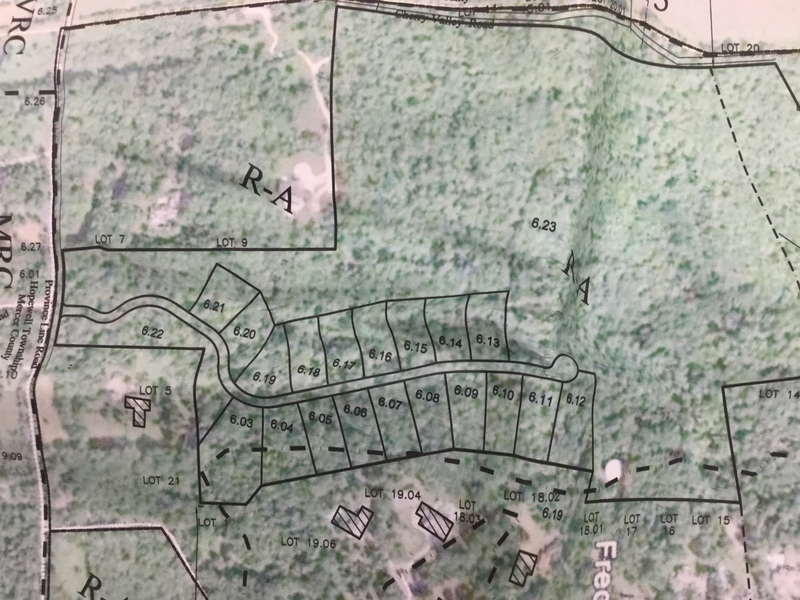 The Planning Board is due to consider another application for construction of homes on the Princeton Ridge at their meeting this evening (2.05.2019). This application relates to the ‘Lanwin Tract‘, between Herrontown Road and Mt Lucas Road, next to Autumn Hill Reservation. This entry was posted in Biking, planning, Princeton, Sustainability, Trails, Walking and tagged cluster zoning, open space, planning, Princeton. Bookmark the permalink.